The Facebook Page Bayang Pilipinas complains about the hypocritical and self-righteous Liberal Party’s (LP’s) impact to the Philippines. The post’s gist is that the LP and their relatives are apparently bringing the country more bad than good and that they criticize other people’s mistakes while turning a blind eye at theirs. The Liberal Party has brought plague to the Philippines, stating that they stand as an Opposition to the current government of President Rodrigo Roa Dutete under the assumption that their solutions and ways are always right and for the people when in reality it hasn’t. They have brought the worst out of the Philippines through exploiting the Philippines’ riches and farmers, Hacienda Luisita, creating laws that burden the hard working employees of the country, all thanks to Cory Aquino’s Hererra Law, and the endangerment to children that the dengue-vaccine Dengvaxia of the former President Benigno “Noynoy” Simeon Aquino III’s administration approved of. With the Yellow Plague being tackled, the Hypocrisy of the Liberal Party is what we should cover next, they state one thing and do another, they say they fight for the people (“The Filipino is worth fighting for”) when in reality they fight to line their pockets. They say that they wanted to end corruption (“Tuwid na Daan”) when in reality, in who’s administration did the Priority Development Assistance Fund and the Disbursement Acceleration Program scams rise? Now other than bringing damnation to the nation, the Liberal Party apparently also condemns the efforts of the Duterte on banning endo and all forms of illegal contractualization through his Executive Order since they state that it’s an ineffective solution. That the Labor Code should be amended by the Congress or Senate, but little to a lot of Filipino’s knowledge, the beloved Cory Aquino ammended the Labor Code which technically started endo and the struggles of the workers of the Philippines with their forever-delayed regularization. Former Bayan Muna party-list Representative Teodoro Casiño refreshes the minds of the Filipinos after recalling the Herrera Law that former President Cory Aquino passed. “She has our full respect in guaranteeing the right to organize and the right to strike. But it was also under her that the Herrera Law was passed. 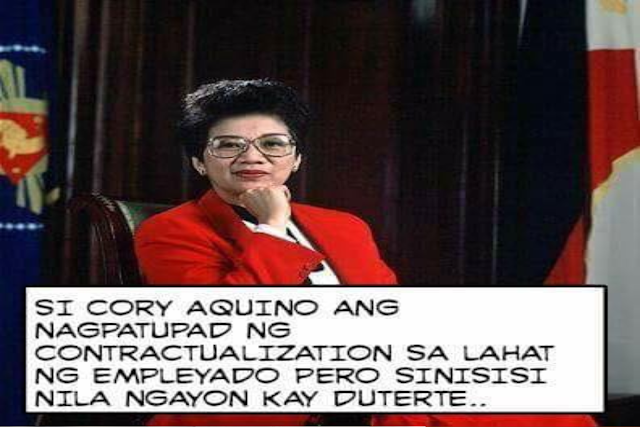 Also, it was also during her time that ‘contractualization’ was institutionalized,” the former representative stated. Former Kilusang Mayo Uno Public Information Officer Renato Asa explained how the Cory Aquino gave the workers their freedom to express grievances yet the Regional Wage Boards (RWBs) and Assumption of Jurisdiction (AJ) of the Department of Labor and Employment Secretary posses hinders the worker’s freedom to demand and complain useless. “With the RWBs, it has become more difficult to lobby for wage increase. The AJ as we know, is being resorted to by the labor secretary to prevent workers from expressing their legitimate demands and complaints,” Asa stated. So Cory Aquino basically gave power to the workers yet made sure that they weren’t going anywhere with it. She states that she’s for the people yet the law that she amended states otherwise. This is proves that one of the Liberal Party’s pillar’s hypocrisy in the most documented and legal way possible. Hacienda Luisita basically enslaves farmers, isn’t their rights also worth fighting for? Just be honest, which Filipinos are you pertaining to, the yellow corruption-empowered rich or the yellow corrupted and exploited poor? Ng ipatupad ni corikong ang contractualization na favor sa kanilang mga negosyo at mga kamag anak na mga nagpapayaman sa bansa, nag ingay ba kayo? Sinundan ni panotxia, nag ingay ba kayo? Tapos ngayon isisi nyo kay duterte, hindi kakayanin ng EO ng pangulo para matapos ang contractualisasyon, dahil nasa batas yan na pinirmahan ni korikong, at kailangan baguhin o amendahan, kaya dapat sa congreso o senado kayo mag sisigaw at sisihin si cory sa batas na ipinatupad nya, at sumunod na naging pangulo si abnoy, bakit hindi kayo nagsisigaw? anong katangahan yan?